Learn how to use a tabletop kiln and this mold block system to create dozens of unusual glass art pieces. The innovative Mold Block System is well suited for use in portable tabletop kilns, offering the ability to create glass forms that are difficult to produce any other way. It’s fun and exciting to design unique mold configurations that continually offer a twist to standard fused glass shapes. Presented in an easy to follow self-directed format starting with an examination of the mold material and cutting the mold block components. 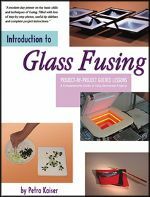 A complete guide from start to finish through the creation of a glass project, including an essential tutorial describing the process to manually fire a tabletop kiln. An 80-page book offering more than 260 color photographs that will inspire dozens of exceptional projects. Features invaluable information covering frit casting molds, tools, equipment and kilns, plus an in-depth yet simple approach to working with digital kiln controllers. 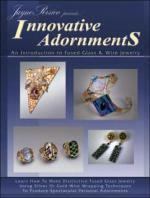 This book is sure to become a studio favorite that fusers of all levels will refer to time and again. 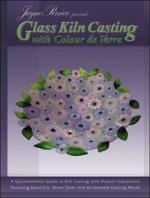 The take-you-by-the-hand writing style guides crafters through the frit casting process. and shows you how to make frit cast jewelry, plates and bowls with amazing results. 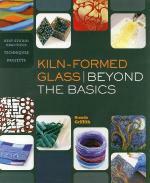 This book is all about the kiln. Each page is filled with all kinds of flowers and dozens of heart patterns. Projects featured are for all skill levels from the novice to the experienced glass fuser. Includes easy instructions and display options. All projects are photographed in full color. Offers you the opportunity to experiment with two different fusing techniques. The first part of the book features designs for the kiln-fired and slumped dinnerware in three distinct styles. When your table is set, move on to decorating your walls with dramatic hot mosaic pictures using kiln-fired glass pieces and additional found embellishments. Step-by-step instructions for each layer of the project. Full color photos. Create elegant light sculptures in your Kiln with instructions for glass frit casting, Fusing assembly & deep-drop slump Forming. This book reveals ingenious lamp-making process using all color photographs, detailed instructions and helpful, step-by-step design tips. You will discover an impressive array of glass kiln techniques from frit casting to tack-fuse assembly to ultra-managed slumping. An 80-page book with more than 160 color photographs of 14 unique projects. Includes details on casting molds, tools, equipment, kilns, and a comprehensive look at digital controller programming. 80 color pages with over 250 color photographs. 12 Complete projects that teach how to make distinctive fused glass jewelry using silver or gold wire wrapping techniques to produce spectacular personal adornments. Techniques are simple enough for new students while providing established crafters additional instruction, practical guidance, motivational hints and refreshers. Photos of 80 Additional Art Pieces also included. PMC is one of the most remarkable developments in silver and gold metal working since lost wax casting was developed thousands of years ago. 96 color pages with over 360 color photographs. 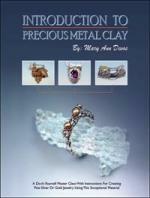 18 Complete Projects that include step-by-step instructions for hand-forming this remarkable clay material to produce distinctive silver and gold jewelry. A comprehensive guide to techniques presented in project-by-project guided lessons. This full color, 80 page book gets started with some easy projects (Tangram puzzle, window shade pull, etc.) and continues with more difficult projects (serving trays, soup bowls, etc.). Kaiser discusses tools, equipment & supplies, kilns, kiln furniture, glass selection and more. The full-size drawings in this book were designed to enable crafters to recreate the fusing projects exactly as they appear. With an emphasis on design composition, pre-fuse assembly and firing technique, you can copy a project straight from the book or make creative personalized changes. Contains 32 full-size line drawings in total - 20 of these are printed on oversized fold-out sections (17" x 22" - 43 x 59 cm). 27 projects which include a list of specifications, firing schedules, the forming mold used and color suggestions. 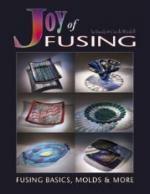 How successful are you when it comes to fusing glass in a kiln? Are your skills growing with each firing? Do you understand the Why as well as the How for the techniques you were taught? This book will help fill in some of the holes in your knowledge base and help improve you fusing skills. The information included will also help you take your work up a level or two by exposing you to option you may never have considered. Learn how to write a firing program and how to keep your glass from breaking in the kiln. 80 pages covering tools, sizing, preparation, bracelet forming, adjustments, embossing, cane fabrication, pattern bar making, and more. Tips and expert advice are scattered throughout the book to clarify specific concepts that will help achieve the best results. These bracelets are beautiful and intriguing and offer glass fusers and jewelry makers a delightful way to expand their skills. Enjoy creating each of the 10 full size designs featured in this book. Each pattern includes detailed, full color step-by-step instructions and firing schedules. Designs included are palm trees, iridescent fish, friendly frog, sunny sunflower, pansies, a rainbow, peak-a-boo sun and a home is where the heart is. 96 pages with over 240 color photos. Over 120 examples in 10 Idea Galleries. 21 Complete Projects with Instructions. Featuring the work of 12 Metal Clay Artists, the 21 projects in this book were carefully selected to demonstrate the versatility of PMC. Releasing the artist’s imagination to explore the capabilities of blending other materials into their work. Precious Metal Clay is sure to enrich the work of jewelers in addition to artists working in polymer, ceramic, porcelain, fabric or art glass. 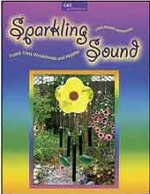 2 dozen patterns shown in full color for delightful fused glass wind chimes, window charms and mobiles. Colorful and easy to make using scrap glass, bottles, driftwood and wire - plus they sound great! Step-by-step instructions. Included are illustrations and color photos to guide you through the entire assembly process. 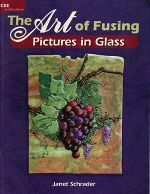 This book teaches the fuser how to make beautiful multi-dimensional pictures in glass using frit, confetti, stringers and other glass components. Included are fourteen designs for an underwater scene, field of sunflowers, a fabulous frog, grapes and vines, herons, desert scene, mountain scene, seagulls, polar bears and more. Glass cutting and basic fusing experience is necessary to successfully complete these projects. 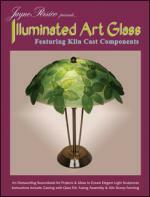 Contains 14 designs for fused glass table lamps. All shown in color pictures and include detailed fusing and assembly instructions and material lists. These lamps can also be used as wall sconces with the purchase of a wall sconce mounting kit. 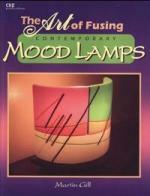 The lamp designs in this book use a 9" x 8" x 3-3/4" wall sconce mold. Included are detailed instructions on how to modify the designs for molds of other dimensions. It's always Time for Glass! 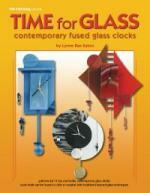 This "hybrid" release features patterns for contemporary glass clocks, offers the hobbyist 11 fun and funky projects that can be created with fused glass or traditional stained glass techniques. Each functional clock is fairly small (the largest is 10"x10") and is created with only a few pieces of glass making it a quick project to create. Glass beads can be strung to create the the pendulum and decorative accents for each clock. Includes full color photos of each clock constructed in each method for a total of 22 images. Materials lists and instructions are also included.